I acknowledge the traditional owners of this place and pay my respects to elders past and present, present and absent. It is always a great privilege for me as an Australian Catholic priest to be invited the National Aboriginal and Torres Strait Islander Catholic Council. This last week I was on Palm Island and in Townsville meeting with some of the Aboriginal Church elders and with Fr Mick Peters who always seems to be the happiest, most contented priest in Australia. Last Sunday he had ten baptisms! His commitment to pastoral ministry amongst your mob is legendary. It is 30 years since I first visited Palm Island. Some say there has been little development, growth or change on these remote Aboriginal communities. Unlike the situation 30 years ago, we sat down to meet with educated, empowered councillors in control of their local community affairs. They took us to inspect two new subdivisions for the building of more than 70 new community houses. This was unimaginable 30 years ago. It's not that things are now perfect. At our public meeting, Lex Wotton one of the most respected residents of the island was in attendance with his parole officer. He was convicted of rioting after the tragic police watch house death of Cameron Doomadgee in 2004. He is still not permitted to attend a public meeting except in the presence of his parole officer. After an extensive round of police cover-ups, no Queensland police officer has faced any disciplinary action for the death of Doomadgee nor for the cover-ups that ensued. Just last week the retiring police commissioner of Queensland, Bob Atkinson said, 'Palm Island was a tragedy for everyone involved.' It was his one major regret as police commissioner. Mr Wotton is the only one to have had his civil liberties constrained. Outside the council chamber on Palm Island there is now a memorial to the seven men who led the 1957 strike against the oppressive reserve conditions of the Queensland Government. The inscription reads: 'In June 1957 seven men were arrested at gunpoint by police, during the night. (They) were herded like cattle onto a boat and sent to Townsville....These seven leaders were found guilty of triggering a long planned strike for better wages, food and housing. They also called for the removal of the superintendent. They were deported to other settlements from their home, Palm Island. The media repeated the government's opinion that a riot had been put down. The following inquiry found there had been no damage either to property or persons and the strikers had convincing grievances.' The struggle continues. But it is always good to remember those who confronted even greater challenges and in our own lifetimes. The starting point for my reflections on faith and culture today is the speech of Pope John Paul II delivered at Alice Springs 26 years ago. No one would claim that the Pope's speech was a determinative catalyst accelerating the positive developments and putting a brake on the negative reversals in Australian church and society these last 26 years. But this speech still embodies the most noble shared aspirations of Aboriginal Catholics and those wanting to see Aborigines take their place in the Australian Church. The speech undoubtedly painted too rosy a picture of the role of the missionaries, glossing over the failings including assimilationist mindsets and the evil of sexual abuse. Only recently has the church come to appreciate its past failings in adopting assimilationist methods such as removing children from their families and placing them in dormitories, and in using English exclusively rather than local languages. The speech gives too optimistic a reading of the prospects of Aboriginal Australians taking their rightful place in the church without the likelihood of Aboriginal priests or bishops in the foreseeable future. The speech too simplistically glosses over some of the disconnection between Christianity and some of the core beliefs and practices of traditional Aboriginal religions. It has been very helpful to have the Pope offer the encouragement that there need not be any conflict between Christian faith and Aboriginal culture. But Aboriginal culture is often founded on religious beliefs which find and express God's self-communication outside of Christ and the Church's seven sacraments. I recall a funeral of a well respected Aboriginal leader in the Kimberley. After the church service, the Elders took the body for ceremony which was no place for the priest or other outsiders. No participant presumed that the religious business had been confined to the church and that all that occurred thereafter was purely cultural. The body and its bearers moved seamlessly from one religious world to another, the bearers and the onlookers respecting the sacred space of each world. If you stay closely united, you are like a tree standing in the middle of a bush-fire sweeping through the timber. The leaves are scorched and the tough bark is scarred and burned; but inside the tree the sap is still flowing, and under the ground the roots are still strong. Like that tree you have endured the flames, and you still have the power to be reborn. The time for this rebirth is now! Everyone present knew that he understood, and more than many who had spent a lifetime in this place. Two years ago, the Roman Catholic Church canonized the first Australian saint, Mary MacKillop, the founder of the Josephite sisters who have provided education and welfare services to the poor, especially in remote and rural parts of the vast Australian continent. Indigenous Australians played a key role in the celebrations. I was sitting with an Aboriginal group at the Mass of Thanksgiving at St Paul's Outside the Walls. Aboriginal dancers participated in the Offertory procession. Aboriginal deacon Boniface Perdjert assisted the Cardinal at the altar. The Aborigines around me were very proud of the Aboriginal participation in the liturgy. It was their participation which rendered the celebration most Australian, even for those of us who were not indigenous. Evelyn Parkin an Aboriginal woman originally from Stradbroke Island beamed a wonderful smile as she surmised about her people completing the circle: Italian missionaries had come and ministered to her people in 1843, establishing the Catholic Church's first mission to Aborigines. 167 years later, her people had come to Rome as people of faith proclaiming their faith to the Italians just as the Italians had done to them. Before the mission was established on Stradbroke Island, the local Aboriginal community of 200 persons was forced to host more than 1000 convicts from the mainland. A prison was run there from 1831—1839. I daresay not all the convicts and their warders were easy-going beachcombers. There is a plaque on the island commemorating the first recorded meeting between Aborigines and Europeans. Matthew Flinders was sailing past in 1803. He and his sailors were short of water. The Aboriginal traditional owners not only invited them ashore. They joyfully showed them where to find fresh water and farewelled them on their way. The first missionaries arrived in 1843. Archbishop Bede Polding the English Benedictine had just returned from Rome where he convinced the Pope to establish the Australian hierarchy. He became the first Archbishop of Sydney. In Rome he had also convinced the Passionist Order to provide four men who could establish the Church's first mission to Aborigines. He had his eye on the talented well connected Fr Raimondo Vaccari who was 40 years of age and was said to be one who 'enjoyed great fame as a preacher, and had many influential friends among the laity, the upper ranks of the clergy, and the cardinals at the Vatican'. The Superior General was most unwilling to let this man go to the other end of the earth. But in the end, he surrendered to all those persons of influence. Vaccari was joined by Luigi Pesciaroli (aged 36), Maurizio Lencioni (28), and the French born Joseph Snell (40). They could speak no English but that did not matter; neither did the Aborigines. Three years ago, we celebrated the establishment of the mission as part of the 150th anniversary of the colony (now State) of Queensland. One of the participants at the liturgy was Mrs Rose Borey. I will never forget her waiting for Pope John Paul II to walk down the Dreaming Track in 1986 when he came for the meeting with the Aboriginal people at Alice Springs. The organisers had been told that the Pope was not allowed to wear the Aboriginal colours. That was no problem. They vested him with a crocheted stole in the distinctive black, red and gold when he reached the track. He knew better than to take it off. As he got close to us, Louise Pandella thrust her three month old son into his arms and he held the baby up to the skies with such love and respect. Rosie was jostling to get close. The tussles all around us made some of those manoeuvrings by nuns in the Vatican look orderly. But Rosie got there and presented the Pope with a framed copy of the Our Father in your local Gurumpul language. She was so proud that a catechist descendant of the first Australians evangelised on Stradbroke Island was able to present the Lord's Prayer in language to the Pope. Fr Vaccari once told Archbishop Polding that the local Aboriginal people did admit the existence of a Supreme Being. They had told him, 'We have not yet spoken to Him, for He has not yet spoken to us; but we expect to see and speak to Him after death.' And now Evelyn Parkin was at St Paul's Outside the Walls expressing delight at being able to proclaim the gospel to the Italians. At the conclusion of the liturgy, some of the Aborigines invited those gathered around them to join them outside the entrance to the church. They had visited the church the previous day, concluding their researches and ascertaining the burial place of Francis Xavier Conaci. They led us in the most moving prayer for Francis, the Aboriginal boy who left Western Australia on 9 January 1849 for training as a Benedictine monk. Francis died on 17 September 1853 aged about thirteen and he lies buried outside the front of the basilica of St Paul Outside the Walls. Gathered around his burial place, we were moved to tears. The didgeridoo was played; a traditional dance was performed; Graeme Mundine and Elsie Heiss led the prayers; and Vicki Clark led the singing of 'The Old Wooden Cross' (the hymn which is sung at most Aboriginal funerals) and the Aboriginal Our Father. Little is known about Conaci other than what is found in the memoirs of Bishop Salvado who departed for Europe with two Aboriginal boys on 9 January 1849. He had come to Perth from the New Norcia mission a hundred miles away in order to sell produce there. The two boys had only been a couple of months in the Mission, so that when they reached Perth everything made them gape. But the thing that most astonished them was a boat — they thought it was a large fish or some animal that could walk on water! We could not manage to convince them that this animal was guided from the rear, for horses, they insisted, have the bit in their mouth and not in their tails (they thought the ropes attached to the rudder were reins). Then, when they saw the large ships, they thought they were the fathers of the boats, and wanted to know if these grew as big as the parent ships later on. Poor lads, everything was new to them! He was then to stay on and offer the Christmas masses in Perth. No sooner had Salvado celebrated Christmas in Perth and the bishop Brady thought it would be best for Salvado to go to Europe given that a ship had arrived in port unexpectedly 'from Sydney on its way to Europe'. Salvado tried to argue his way out of it, but to no avail. 'When the two boys heard of my imminent departure, they begged me to obtain permission from the Bishop for them to go with me to Europe. The Bishop was happy to meet their eager wishes, and so I got the approval of their parents and made everything ready for the voyage. On 6 January the boys were baptized by the Bishop with the names of Francis Xavier Conaci and john Baptist Dirimera, which I had earlier given them at the Mission. The Secretary of the Colony, Dr R R Madden, and his wife were the godparents.' Salvado surmises that the tribal name 'Conaci' would have been bestowed by the father who traditionally would choose a name suggested by something that happened at the time of the birth. A black cockatoo (manaci) may well have passed by. Some claimed that the Australian natives were incapable of intellectual formation, of understanding the benefits of civilisation, or the right of property, and there were other absurd statements which there would be no point in repeating here. My only answer was to trace the story of the Mission of New Norcia....and specious allegations simply collapsed before the facts. They then went on to Paris where there was still civil disruption on the streets following the workers' revolt of the previous year. Soldiers were pursuing some rioters through the streets on 13 June 1849. One of my boys, agitated by this extraordinary display, asked me what it was all about. I told him that some of those who had just rushed by shouting were bad men, and that the soldiers were going to fire on them if they failed to keep the peace. 'Because this is not my country, and I don't know anyone here', I replied. The boys were then delivered to the Benedictine Monastery of the Holy Trinity in Cava, Italy. The boys then entered the noviceship at Cava on 5 August 1849. When describing the physical and intellectual qualities of the Aborigines, Salvado quotes two letters he received from the boys. Francis was clearly progressing much better at his studies than was the older John Mary. Salvado was assured by their teacher that the boys had composed and written the letters themselves. It is with great pleasure that we received your welcome letter, dated 1st July, by means of which we learnt that you are in good health, and we assure you that we are, too. We hope that your occupations will leave you free at least for a few days, so that we can have the consolation of seeing you again and kissing your hand. When Francis fell ill at La Cava, he was taken to St Paul's Outside the Walls to take the fresher air. There he died on 17 September 1853; and there he was buried. John did not fall gravely ill until May 1855 whereupon he was returned to Australia, dying three months after his return on 21 August 1855. Many of us who had arrived at St Paul's Outside the Walls knew nothing of this story. The simple Aboriginal ritual over the burial site of Conaci was in stark contrast to the pomp and hierarchical ceremony in St Peter's Square the previous day. Here were indigenous people not only finding voice but leading those of us who are the descendants of their colonizers, teaching us the history, sharing the story, and enabling us to embrace the mystery of it all in prayer. Our role was to follow, to join in prayer and to express thanks for the gracious sharing and leadership of the indigenous people. Two nights before the canonisation the Vatican Museum opened a display of Aboriginal artifacts and works of art which had been sent from the missions to the museum in 1925. Indigenous Australians placed their indelible mark on proceedings with song and dance in the Vatican Gardens. Aboriginal and Torres Strait Islander Catholics from across the land mixed with bishops, donors, politicians and pilgrims accompanying the Josephite sisters wearing not brown veils but their light blue pilgrim scarves. William Barton on the didgeridoo joined his mother Delmae and a string quartet under the lights of the dome of St Peters. Four years previously Delmae had lain uncomforted with a stroke at a university bus stop for hours as hundreds passed her by, prompting a national reflection reminiscent of the parable of the Good Samaritan. This night she and her son gave all Australians a place of belonging in this sacred place. The Vatican Museum put on display Aboriginal art sent from the missions back in 1925, predating by 50 years most of the Aboriginal art on display in galleries back home. The two spirits on the right make the fire; the two spirits on the left get the meal of fish ready; Jesus' friends (are) at the bottom of the picture. His friends did not know that the fire would make a big smoke. It make a big smoke and come up behind the hill and took Jesus up to Heaven. That smoke bin come and lift him up and take him away to Heaven. Hector was encouraged to paint in his home community by the Josephite sisters who had established a spirituality centre nearby. They also ran the community school and assisted at the old people's home. The sisters were not trained anthropologists or art advisers. Like Mary MacKillop they came amongst the poor in a remote area, shared what they had, educating the children and encouraging the adults. None of the sisters would claim any of the credit for the art of Hector and his school of Turkey Creek painters. But for the sisters' presence at Warmun all those years, I doubt that Hector's paintings would now be hanging in the National Gallery. His Holy Spirit painting is now replicated in a huge and majestic mosaic at the Australian Centre of Christianity and Culture. But for the selfless dedication of the sisters all these years throughout Australia, I doubt that there would have been 8,000 Australians in St Peter's Square two years ago attesting the holiness of Mary Mackillop. Such celebrations confirm that indigenous identity is still strong and resilient though ever adapting for individuals and communities who have endured much by way of dispossession, dislocation and disempowerment. With a confident identity and secure sense of belonging in both worlds, indigenous people might 'gradually banish the painful sense of being separated from their ancient connections'. Those citizens who are recent migrants are joined with the descendants of the colonisers, accepting the national responsibility of correcting past wrongs so that the descendants of the land's traditional owners might belong to their land, their kin and their Dreaming in the society built upon their dispossession. Plenty Coups' dream — and his fidelity to it — also enabled him to live what Aristotle would call a complete life. In spite of the devastation to traditional Crow life, Plenty Coups's dream became a thread through which he could lead his people through radical discontinuity: and at the end of his biological life, he was able to see his life as having a unity and a purpose that was confirmed by the unfolding of events. Indeed, the repetition of his story to Linderman is its completion. In telling his story, he presented himself as having a complete life; and he was able to pass on to a future generation what he thought was still essential to the Crow way of life. At the liturgy at St Paul's Outside the Walls, some Aborigines thanked me for accompanying them and for sitting with them during the Mass. I would not wanted to have sat anywhere else. It was such a privilege to share the fullest liturgical expression of indigeneity colouring and leavening the universal, globalised Roman ritual. They, and only they, are able to bridge the radical discontinuity of their lives and history, finding a place of belonging in a globalised world where the Market can attribute value to everything, except that which is most important and valuable to the human person — that radical hope which allows us to weather the worst storms of the Market in all its manifestations. Indigenous people know this better than most of us because they have endured the market forces of empire which denied the value of all that their ancestors held dear. Thank you for all you NATSICC members do to show us whitefellas a culturally enriched living and proclamation of the Gospel. The above text is from Fr Frank Brennan SJ's address 'Culturally Enriched Through the Gospel' at the NATSICC Conference, Bell Rydges, Preston, on 1 October 2012. 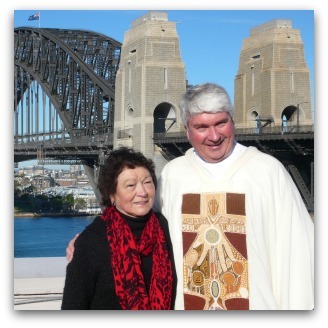 Photo: Fr Frank Brennan with Elsie Heiss, Leader, Aboriginal Catholic Ministry, Sydney. I have long pondered what it means to be an Australian as distinct from people of other lands and cannot shake the belief that to be an Australian requires that we see ourselves as part of the continuum of human occupation of this land over the last 60 000 or so years. Father Brennan's description of the wholeness of aboriginal culture and their beliefs in the context of our Christianity is a helpful picture that most of us cannot as yet understand or relate to. How does the spirituality of our native culture based on this land relate to our Christianity from Jesus and the Church? Perhaps Father Brennan needs to tell us more and explain what it means to be a an Australian in the context of 60 000 years of peopling in this land. An immensely moving piece Frank. What a rich lifetime of experience, research and reflection it reveals and embodies. It would be wonderful if it were available as a published monologue and could be at hand both to shape the attitudes of people who still need its understandings and to reinforce the conviction of those of us to whom they are already a valuable possession. I teach RE at a catholic secondary school. Our topics for year 10 this term are Catholic Social Teaching and Ingigenous Spirituality. I have now the best resource I can hope for . What an inspiring and enlightening speech. I am a Victorian catholic primary school teacher who spent nine years working in the Kimberley in remote indigenous schools. It gladenned my heart to read Frank's reflections and fuelled my hope that this current generation of indeigenous children will negotiate and assume the best of both cultures and faith traditions with more ease and less apin than generations that have gone before. With role models like those whom Frank has highlighted here,(and who should be widely promoted for their courage and talents) they should stand strong in their convictions and lead us non-indigneous in better preparing for an uncertain environmental and sustainable future. The story of the aboriginal boys from New Norcia, Francis Xavier and John Mary, is amazing - walking the streets of Paris and Rome as they did in 1849-50, their Godfather, Dr RR Madden, was essentially run out of WA, as Colonial Secretary he pushed too hard to soften and reform legislation and policy for controlling and defeating the local indigenous groups, he was a proven human rights campaigner from the campaigns of the Irish home rule and anti-slavery movements but in Perth he found himself to be, as a high standing Catholic, very much a lone voice amongst an almost anti-Catholic and very pro-development politic. DR Madden deserves some recognition as the one first humanitarian campaigners to endeavour to cut a better deal for WA's aborigines.